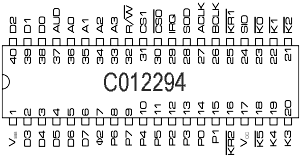 On that date layout designer Steve Stone and I were doing one of the horrible tasks they don’t tell you about when you think you want to be a chip designer. We were painstakingly checking the hundreds of thousands of transistors, interconnects, contacts and vias in the Pokey layout completely by hand. Of course today, thanks to modern layout tools, this process is totally automated. Today all you have to do is design your chip in some high level programming language such as Verilog, press a few buttons and voila! you’ve got a chip. But back in the bad old days it was all done by hand. Me: (Looking at the Schematic) – “The trace is D3”, and with a yellow highlighter, I mark the trace and the nand gate. Steve: “The trace from the output of the nor gate goes to a 2-input nand gate”. Me: “That trace is Audio4”. It was the second week of the NFL season, and the San Diego Chargers were playing the Oakland Raiders. Now as it turns out, Steve hated the Raiders, for reasons I can no longer remember, but at any rate he was rooting for the Chargers. So there we were working away, with Steve muttering about how the Raiders always won and dirty tricks and so on. This game however looked to be different. …Stabler fumbled the ball, and it rolled towards the San Diego goal line. Running back Pete Banaszak tried to recover the ball on the 12-yard line, but could not keep his footing, and bobbled the ball even closer to the end zone. Raiders tight end Dave Casper was the next player to reach the ball but he also could not get a handle on it. He batted and kicked the ball into the end zone, where he finally fell on it for the game-tying touchdown as time ran out. With the ensuing extra point by placekicker Errol Mann, the Raiders won, 21-20. It was to be known in latter years as the Holy Roller. The game is listed in Wikipedia, and thanks to the internet you can even listen to the same radio broadcast we heard way back in ’78. Considering the historic nature of the “Holy Roller”, Steve took it reasonably well, we continued on with the terrible task at hand and the Pokey chip took it’s place in history too. One thing that’s got me wondering though, did the name Oakland “Raiders” have anything to do with the naming of “Star Raiders”?